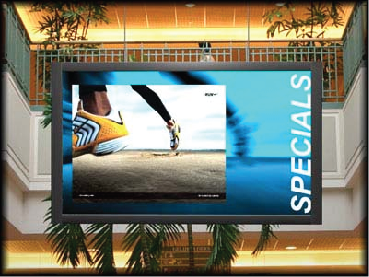 WavTeK Digital Signage Solutions | Technology, At the Speed of Life! WavTeK Managed Digital Signage Systems provide fully remote controlled signage and marketing solutions with minimal maintenance and rich real-time content and data retrieval. WavTeK’s Display Management System allows static content like pictures and text for be displayed as well as full motion video, Flash, RSS feeds, News tickers, as well as combinations of multiple elements in one screen. 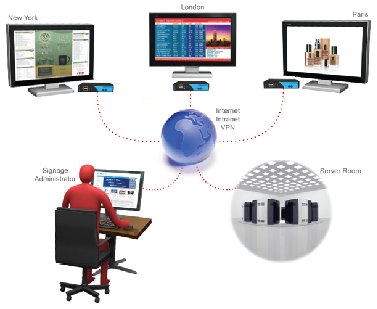 Information can be fed to the screen over the internet or local servers. We setup a screen at your location with a small computer on the back that retrieves the content from our server and displays it. You login to our web portal and design your ad’s and layouts (or we can do this for you!) and then simply select a screen and rotation schedule. In a few min your screen will start to be active! Because the system is fully web based you don’t need any special hardware or software to work with it just a modern web browser and you can update and create content from anywhere! Our servers handle all the content so there is nothing to worry about on your end and in the event a client screen PC fails setup only take a few minutes and in the portal to assign your existing content to that new pc and in a few min its back and just like it never had an issue. Management of the system is fully web based and works on Windows, MAC, and Linux*. With our signage system whether you have one location or hundreds they all can be managed from anywhere with internet access. Displays can be grouped by location, store, or distribution area. This allows simple and easy management of large numbers of displays with the same content. Call for more information or custom needs!